The 10 Baht banknotes have little change many times. All types of them are as follows. 10 Bath type 1 the lower left is Thai number and Thai alphabet. 10 Baht type 2 change the number at lower left to Arabic. 10 Baht type 3 delete lower left serial number and change the upper right alphabet to Thai. 10 Baht type 4 change serial number to 7 digits and change the color of the back side to greenish yellow without watermark. 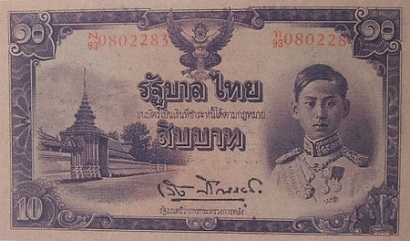 Plain note without serial number nor signature UNC about 18,300 - 19,200 baht. 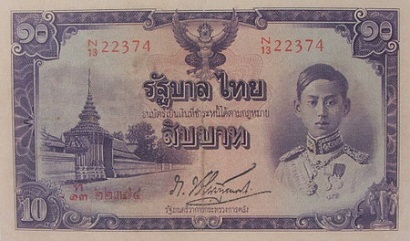 Type 1 ordinary number signature Pao UNC about 18,000 - 18,500 baht. Type 1 ordinary number signature Pao VF about 5,900 - 6,200 baht. Type 2 ordinary number signature Pao UNC about 35,400 - 37,200 baht. Type 2 ordinary number signature Pao EF about 20,000 - 21,000 baht. Type 3 ordinary number signature Pao UNC about 16,000 - 48,300 baht. Type 3 ordinary number signature Pao EF about 10,600 - 11,200 baht. Type 3 ordinary number signature Leng EF about 9,900 - 10,500 baht. Type 4 ordinary number signature Leng VF about 35,400 - 37,200 baht. 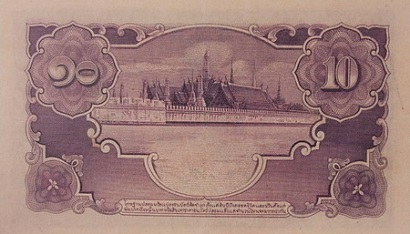 The 5th series 10 Baht type 1 banknotes were announced on 28th May 1942. 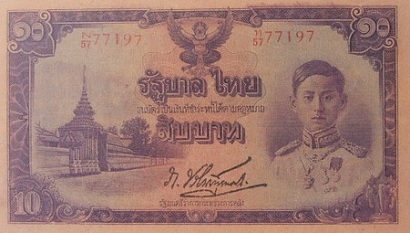 The 5th series 10 Baht type 2 banknotes were announced on 28th Novemberl 1942. 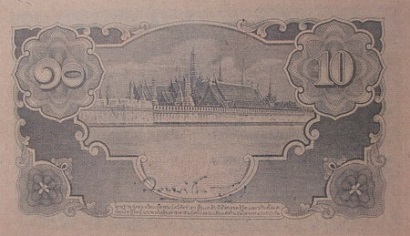 The 5th series 10 Baht type 3 banknotes were announced on 24th Febrauary 1944. The 5th series 10 Baht type 4 banknotes were announced on 26th March 1945. The main object is the image of King Rama 8 on the right. The left is the image of the Crown-top Gate at the Reclining Buddha Temple. The middle is the "Thai Government" on guilloche design. The serial code and number were printed with red ink. The watermark image is the constitution on pedestal tray.